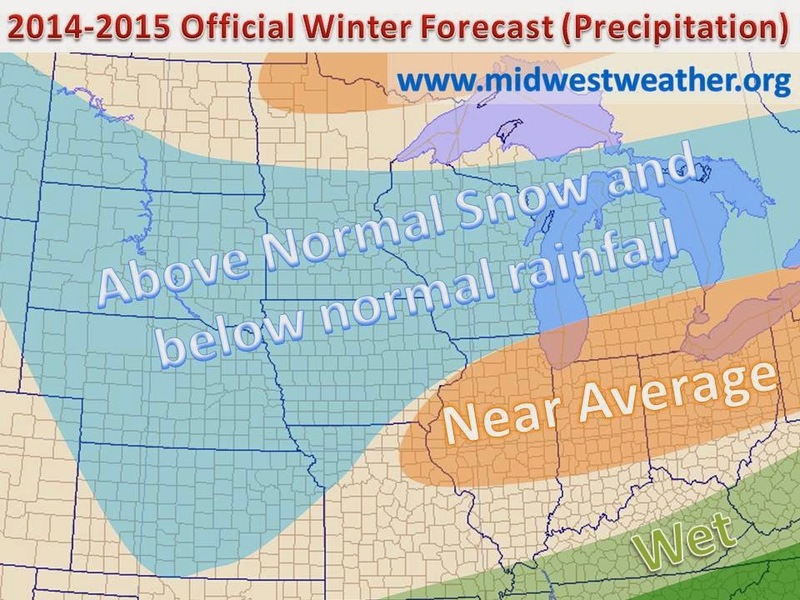 2015-2016 Winter forecast to be released mid/late October! Be sure to bookmark this page and check back for updates. 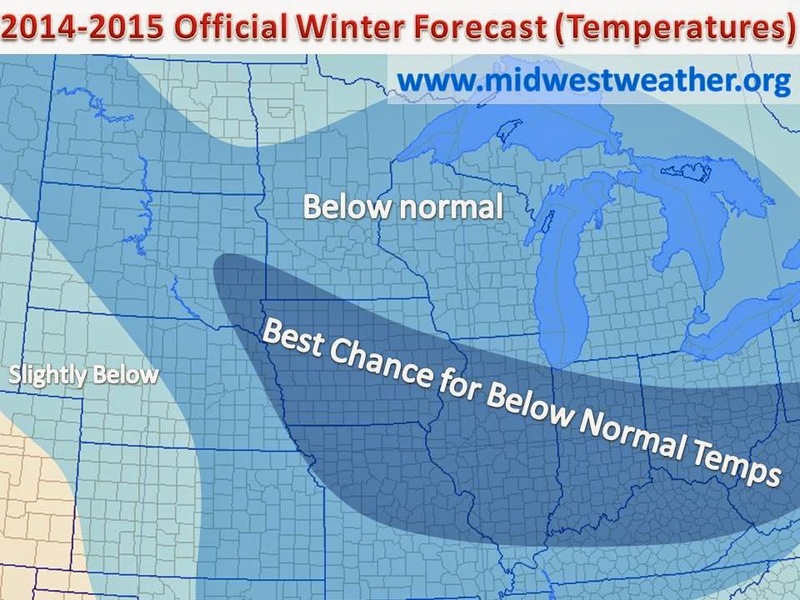 Initial thoughts signal warm winter, but what about snow? and specific regions, full forecast coming soon. There are many factors to look at when creating a winter forecast. Distinguishing between the relevant and more successful ways to predict a long range forecast is very important. Over the past few years we have found the best indicators for the upcoming winter and will explain their influence on Midwest weather. The following will examine the main factors and we will out it all together in the end of this post as our winter forecast. 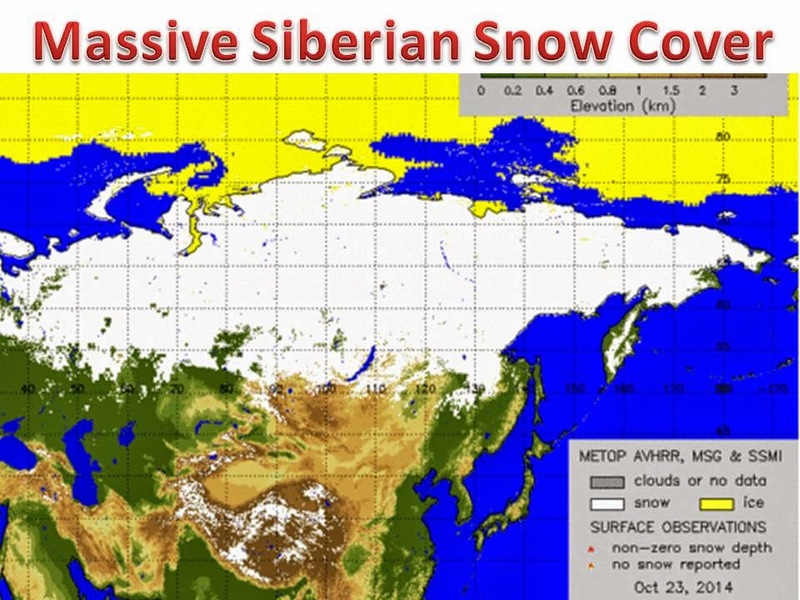 So let's begin....with Siberian snow cover with one of the easiest factors to understand. Simply put, more snow in Siberia, the colder of a North American winter. Because weather flows around the planet at an arguably 25 day rate (see LRC Cycle), it is only natural to examine the characteristics of what is upstream of the Midwest. Snow cover in this region increases the albedo (a measure of reflectivity). The increase in reflectivity of the sun's radiation surely leads to a decrease of temperature in Russia. This will in turn lead to more snow, and even more reflected radiation back into space. The cycle, we call winter, has started early for Russia and is even more pronounced than it was at this time last year (using October 23rd data). The Polar jet then advects this colder air into Canada, decreases the temperatures in the area and increases snow cover. The increase in snow cover over Canada tends to increase the magnitude of cold shots, by the same principal and the Russian snow pack. While the former made a decent case for a cold winter, there are several other (larger) factors in whether the winter will be above or below normal. 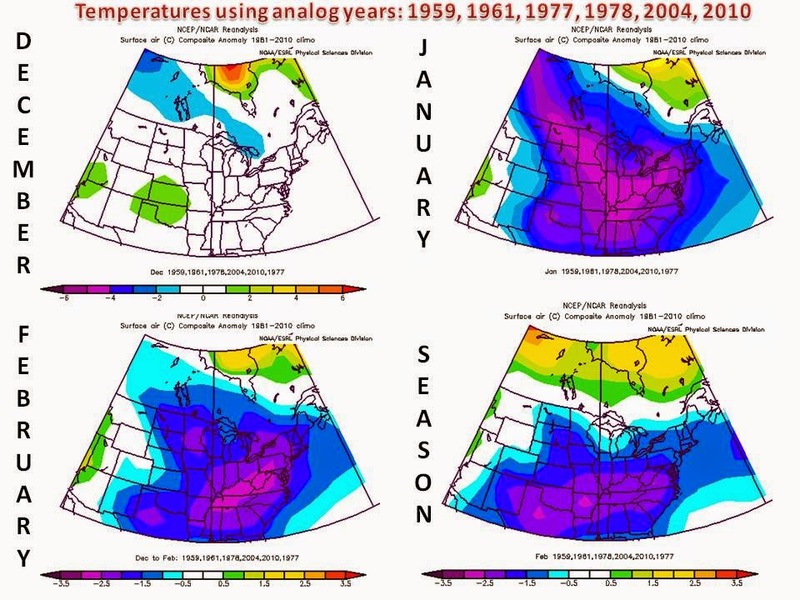 Let's dive into, with arguably, the most efficient and accurate method to seasonal prediction...analog years (which are basically years that recorded similar atmospheric conditions and values as this year). The best analog years: 1958-1959, 1960-1961, 1977-1978, 1978-1979, 2003-2004, 2009-2010. The winter of 1978-1979 was a brutally cold winter across the eastern half of the country, and came after a already cold winter (1977-1978) hmm, coincidence? The following uses a analog climate modeler through NOAA, which can be found at This Page. As you can see above, the analog years really put a grip on the Eastern half of the country in terms of cold and cold shots. It is actually a similar result to the Last Year's Midwest Weather Winter Forecast, which had success, especially in terms of temperature. The CPC and other computer models poke to the idea that a light El Nino will form for the winter. Even if this pans out, ENSO values will still be near 0.0 and the above pattern seems likely. A great example comes from just year, where an El Nino was predicted, but was never a major one with values topping out around -0.6. The exact ENSO values for the winter are unknown, but either way I expect a neutral like pattern across the Midwest this winter! 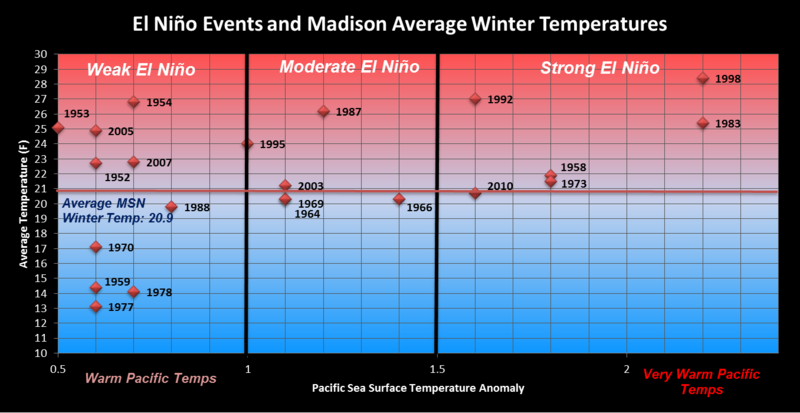 Above is a plot of temperature in El Nino years for Madison, as example. Notice the weak el nino has minimal correlations for the average temperature across the region. It is important to take more in account than just the ENSO, as evident by the plot above. Another, more localized, player in the upcoming winter is the sea surface temperatures of the Great Lakes. A product of the past winter, all five of the Great Lakes are running well below normal in terms of average water temperature. On the right is water temperatures of Lake Superior, for example, notice the 2014 plot compared to the past 5 years. It is well below average and the trend of the past five years. Without using water temperature models, a simple interpolation suggests water temperatures will continue to stay below average and on par of this past winters water temperatures. We will use Lake Superior as another example, as it the largest and most upstream to weather patterns. The plot on the right (from GLERL) shows the historic average and 2014 values over time. Water temperatures have yet to recover from this past winter and Remember this?, Lake Superior still had ice sheets in June! While it has retreated closer to the 22 year average, computer models project water temperatures to decrease in the coming weeks to follow the general trend of 3-6 degrees below normal. If you have ever stood by a lake during the springtime with a onshore breeze, you certainly understand the effect a lake can have on local weather. The larger the lake the larger the effect. In the fall the Great Lakes actually keep surrounding states warmer, as the water cools slower than the land, so winds will blow warmer air over the surface. However, subtract 3-6 degrees from the water temperature and a whole different story is told. The Great lakes will simply lose a degree or so from the cooler lakes than usual. At the same time, lakes will freeze over more quickly, which will limit the lake effect snow machine. We still expect near average snow in the snow belt regions of the Great Lakes. Here it is...the official forecast. Below normal temperatures are favored throughout all of the Midwest. With a southeast flowing jet, the regions with the highest probability of colder than normal are indicated in the darker shades. For precipitation, expect a near average total, with above average favored further south. However, similar to our analog years, snowfall will likely be above normal by virtue of the ratio of snow to rain. An active "Alberta Clipper" pattern could set up after an established snow pack in January.